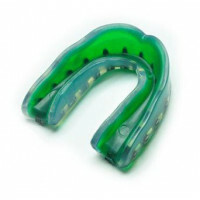 Our 70-second, custom fit, triple density Mouth Guard features a contoured outer shell, soft inner lining and a shock absorbing spine insert. 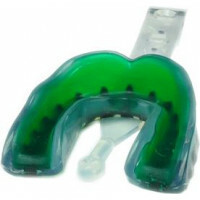 Provides maximum protection against tooth, jaw, and gum injury. 70% less expensive than our competition. Includes a $15,000 dental injury warranty. 70-second custom fit with one-piece quick release strap.